Receiving the nomination form from the head of the delegation, El-Rufai described the development as the most pleasant surprise of his life. The Independent Petroleum Marketers Association of Nigeria (IPMAN), Petroleum Tanker Drivers Association (PTD), National Association of Road Transport Owners (NARTO) and two other associations have bought the nomination form for Kaduna Governor, Nasir El-Rufai’s second term bid. 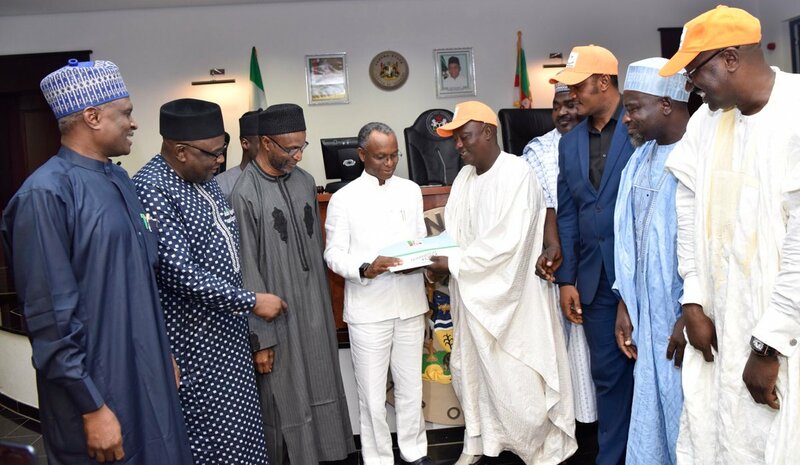 Receiving the nomination form from the head of the delegation, Alhaji Abbas Likoro at the Sir Kashim Ibrahim Government House, Kaduna, yesterday, El-Rufai described the development as the most pleasant surprise of his life. The governor said “when the party fixed the money for form, I could remember that during the meeting, the president was the first person to raise his hand and said he did not have N50 million to buy his nomination form. “In fact, we, the governors started discussing on how we would raise the money for Mr President. We said each governor would contribute N2 million. And, we travelled to China and it was in China I told the president that some group have purchased the form for you. So who will buy my own for me? I don’t have N20 million also to buy my form. The money I have in the bank is not close to that amount. I have only one account in Guaranty Trust Bank. Except I sell my house, will I be able to raise that amount?” El-Rufai asked. He told the delegation that he accepted the nomination form in good faith and will redouble his efforts in improving the lives of the citizens of the state. El-Rufai re-assured the delegation that he will continue to ensure that whoever is living in the state, irrespective of his or her religious or tribal inclinations gets justice. Earlier, Likoro remarked that, they were in Government House to plead with the governor to re-contest so he could do more for the state. He said his group, IPMAN, PTD, NARTO, Traders of Sheikh Mahmud Gummi Market and The Katsina and Daura People’s Association, whose members reside in Kaduna, decided to purchase the nomination form for El-Rufai. Meanwhile, former National Secretary of the Independent Petroleum Marketers Association of Nigeria, (IPMAN) Mr. Mike Osatuyi, has been appointed National Secretary of Buhari Campaign Organisation (BCO) ahead of the re-election of President Buhari in February 2019. The appointment was contained in a statement issued and signed by BCO National Coordinator, Alhaji Pasali Danladi. The appointment was ratified last Thursday, at the National Executive Council meeting in Abuja.